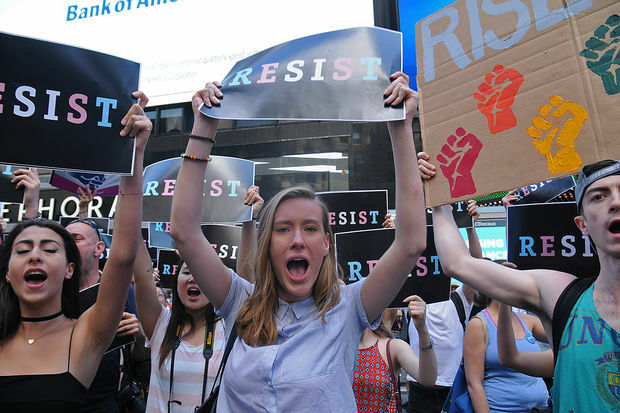 Hundreds of demonstrators gathered in Times Square Wednesday to protest President Donald Trump's proposed ban on transgender people in the military, July 26, 2017. MIDTOWN — More than 1,000 demonstrators gathered at the Times Square military recruitment center Wednesday to protest President Donald Trump’s proposed transgender military ban. But protesters countered that a ban would infringe on transgender people’s civil rights. Yael Leberman, 24, said she had three brothers who served in the Israeli military, where transgender people serve openly. "To say trans people can't contribute to the military is bullsh--t," said Leberman, who is gender nonconforming. 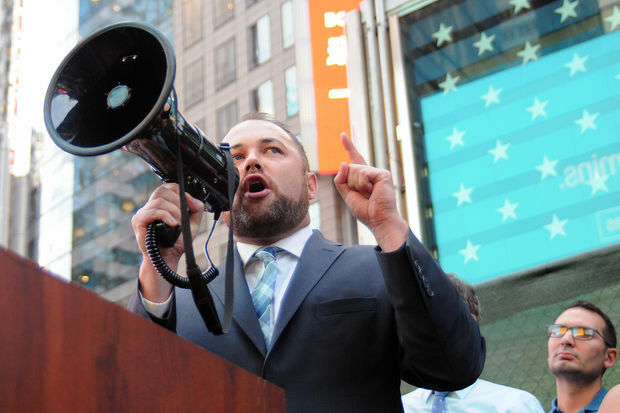 "It's just bullsh--t."
City Councilman Corey Johnson spoke out against President Donald Trump's proposed ban of transgender people in the military during a rally in Times Square Wednesday, July 26, 2017. Vietnam veteran Christopher Countey, 70, said he was angered Trump made the announcement on the 69th anniversary of President Harry Truman integrating the military. “He’s a coward because he avoided the draft by getting a note from a corrupt doctor,” Countey added. “He’s a traitor because he and his campaign have colluded with an enemy of this country to influence the democratic process." The announcement came while the Senate was in the midst of voting on Affordable Care Act replacement plans. City Councilman Corey Johnson said he thought transgender people were being used as "scapegoats" to distract from Trump's failures in office like not yet being able to repeal the ACA.